I’ve always thought that a person needs to do one thing every year that scares the crap out of them. I’m very happy to have checked that item off my to do list for this year! My day started with two iPhone alarms ringing at 5:00 am on Sunday morning – not that I needed the alarm to wake up, as I had been awake, on and off for most of the night checking the time on the hotel alarm clock to gauge how many hours of sleep I had left until 5:00 am rolled around. I guess I was a bit nervous. She did NOT like that idea at all and informed me that I wasn’t allow to make my own way across the Gordon, and had to wait for the first scheduled ferry at 8:30 am. She warned me that it was dangerous because the river is narrow, and early morning fishing boat traffic might not see me in the dark. I told her, politely, that not getting an early start on the day was MORE dangerous because I risked missing the last Nitinat ferry, and might die form hypothermia. And, that running difficult sections of the trail after sunset when I was tired and prone to injury is also very much a safety concern. I also informed the park ranger that I had called her office the week prior, and was given permission by her supervisor that I was free to cross the Gordon river anyway I wanted, as long as I paid the ferry crossing fee. She had no option but to allow me to do it. Helen and I arrived at the Gordon river by 5:45 am on Sunday morning, and I quietly slipped the cheap $29 inflatable dingy into the dead-calm Gordon river in pitch darkness by the light of the rental car head lights, and my triple A battery powered head lamp. I had inflated the dingy on Saturday using a little 12 volt compressor and jammed it into the back of our rented Ford Explorer so it was ready to go. 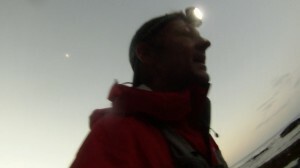 I kissed Helen goodbye, climbed into to my plastic raft and started my short row across the Gordon in total darkness. And quiet. Where was all this fishing boat traffic I was warned about? I had some trouble finding the WCT trail head in the dark with my small head lamp, but finally figured it out, and pulled out of the Gordon and dragged my raft up the trail a few feet. I had scribbled “FREE – Please row me to shore” on my raft with a pen. My idea was to give the boat to a returning hiker who did not want to wait for the ferry. Helen told me later that not more than 30 minutes after I crossed the river, a steady, and heavy stream of fishing boat traffic did indeed start streaming down the river from the marina in Port Renfrew – so if you are considering running the WCT, and want to employ this strategy to cross the Gordon, make sure that you go very early – BEFORE the fisherman head out for the day, and be very careful. I can see how this is going to be a problem for Parks Canada, as it is only a matter of time before someone is hurt. I think the solution is to offer an early ferry service for runners. Also – make sure you leave from the camp ground beach – not the ferry dock or you might be fined for trespassing. Do not ditch your boat on the other side, or you will be hit with a fine for littering in a national park. I made arrangements with the first finishing hikers I found on the trail to take my raft back to shore – which they did, and I am very grateful. “What the hell am I doing here?” was the question I was asking myself as I started to struggle up the extremely technical trail at 6:15 am by the light of my little headlamp. It was so dark, and I could only see a few feet in front of me – and, it was TOUGH going! 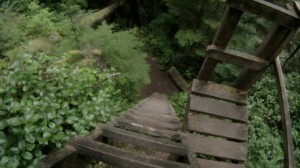 The first section is a 600 foot climb through roots, mud, fallen tress, jagged rocks, boulders, puddles – yikes! I timed my pace and I was going VERY slow!! It occurred to me after the first hour or so, that perhaps my goal of finishing the run in 12 hours was a bit naive and unrealistic. Then it occurred to me that unless I increased my pace, I might not make the last Nitinat ferry – and that was something I did NOT want to happen. As the sun rose, I started to pick up my speed, running every marginally ‘runnable’ stretch possible. And I started to trip and fall. A lot. A few cuts on my shins from branches or who knows what, a fall off a slippery log onto my head, a shoe lace caught on a branch, my foot skidding through mud, branches hitting me in the head, etc. Running this trail requires so much concentration – so much focus on the placement of each and every step. It is really taxing! After a few hours I reached my first beach section and loved it. The sand up higher on the beach was soft and deep and very hard to run through, but I found that I was able to make good time on the firm, wet sand near the incoming surf. After completing so many ultra endurance events including quite a 7 ultramarathons (two 24 hour ultramarathons, three 100 mile races, and two 50 mile races), I know how important it is to pay VERY careful attention to hydration and getting in the calories early on. I was trying to consume one water bottle and one PowerBar per hour. For water, I was refilling from the many streams that crossed the trail – both on the beach and inland, then purifying using an iodine tablet. I was paying very careful attention to the time, and my pace – constantly doing the mental math to ensure that I would reach the ferry by 5:00 pm. I don’t think I ever walked a runnable stretch, and when I was forced to walk, it was as fast and hard as my racing heart rate would allow. 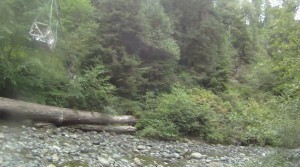 The west coast trail either runs inland through the forest, or along the beach, or both. By both, I mean either, as in the hiker or runner must choose. Sometimes a beach section is faster if the forest trail is muddy, or log strewn, or excessively hilly, or requires climbing up huge ravines by a system of numerous ladders – all of which are exhausting and time consuming. 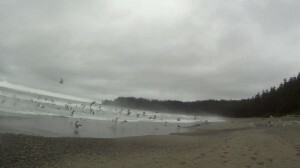 Sometimes the beach sections are difficult due to soft, unrunnable sand, sea weed covered slippery rock shelves, impassable headlands due to high tides, or just downright dangerous with evil surge channels that must be vaulted over. Each time I was faced with the forest or beach option, I had to weigh the pros and cons, dangers and advantages, then commit to my decision and go. After a nice long beach run, it was time to head inland, and that usually means climbing up a ravine using ladders. On a particularly long and towering set of ladders, I felt my quads start to cramp up a bit and realized that I had been sweating a lot, and probably not replenishing sodium. So, I started to sip a tiny bit of sea water during the beach runs. I finally reached the Nitinat Narrows at 4:00 pm, one hour before you won’t pay the ferry man to get you to the other side (I think you need to be at least 40 to get that 😉 Carl Edgar, the ferry driver sold me a Coke and 3 bags of salty chips, offered me a water bottle re-fill (yea, no iodine taste! ), and whisked me across. There were some other hikers at the narrows enjoying some fresh crab that the First Nation tribe sells, and as always, they were totally amazed that someone would be running the entire WCT in a day with nothing more than a small day pack. I encountered this many times on the WCT. Typically it takes 7 to 8 days to hike the West Coast Trail and you get a real feel for the distance and the difficult terrain. To imagine someone covering that terrain and distance in a single day, not seven days, is really quite mind boggling. The chips and sea water seemed to do the trick, and my leg cramps faded away. Now that I had made the ferry, my next goal was to log as many miles as I could before night fall. The weather had been slowly deteriorating all day from a drizzle, to light rain and was now raining fairly heavy. Although I was sweating and working hard, and still warm enough, I knew that the temperature would drop as it got darker. Plunging temperatures combined with more precipitation in the forecast, and a possible decrease in heart rate due to a very technical section, poor visibility due to the darkness and headlamp, and the possibility of fatigue could easily lead to hypothermia. I’ve been there before, and this was becoming a very big concern for me. The rain was becoming relentless and steady, and I was becoming totally drenched. As sunset approached, so did the second high tide of the day. Near the end of one particularly long beach section, I knew there was a rocky point coming up that was marked off on the map as impassable at high tide. 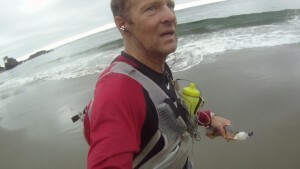 My motivation was to motor as fast as I could to beat the high tide so I could make it over the point. When I finally reached the point, my heart sunk when the foot prints in the sand disappeared into the incoming waves. I considered my options – to climb over and around the rock, or wait for who knows how many hours for the tide to ebb. I climbed up onto the rock, and started to scale around the edge, over the surf to get a better look around the corner. 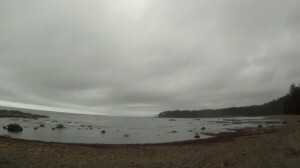 I could see that the beach opened up again, so I continued my way around and over the rock. My foot slipped and I fell into the ocean up to my waist where I back-tracked and gave it another try, this time making it over and back onto the beach. No big deal and the next short beach section made for some good running, but my shorts and legs were soaked. When I reached the 17 km to go sign at 7:30 pm, I happened upon the last of three West Coast Trail patrol cabins. The First Nations guardians staying in these huts during the WTC season from early May to late September patrol their section of trail and assist with rescue operations, trail maintenance, and radio communications with the Coast guard, and WCT trail offices in Port Renfrew and Bamfield. For safety reasons, the location of these three huts is marked on the maps provided to all hikers. One of the patrols – Louie, was standing outside the cabin as I ran by and said “oh – you’re the runner. How are you doing?”. Via radio communications, all of the patrols knew my whereabouts which is pretty comforting. I said I was drenched and getting a bit cold. He suggested that I come into the cabin to warm up, so I said sure. 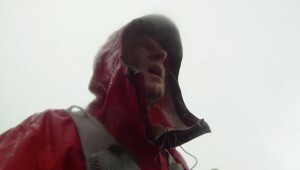 Once I got into the cabin, Louie and his co-worker Jack suggested that it would NOT be a good idea to continue, as the weather forecast was calling for heavy rain all night and there would be no place over the next 17 km (about 3 to 4 hours of running – possibly more after it got dark) to take shelter. Louie invited me to sleep in the spare bunk and offered to dry my soaking wet clothes over the wood burning stove. His offer was tempting, and he was right – what would I do if I really started to get cold and couldn’t get my heat rate high enough to stay warm? What if it got much colder after dark? What if the rain got heavier? 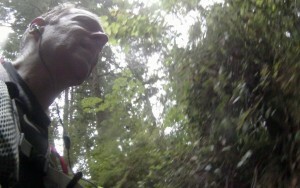 What if my headlamp didn’t illuminate much of the trail in the thick mist and rain after dark? That would certainly force a slow-down, and a slow down always means heart rate reduction which, for me at least, almost always results in becoming very cold. The only concern I had was that there would be no way to notify Helen who was waiting in the Explorer at the Bamfield trail office for me to finish. If I didn’t show up, she would probably phone emergency or the coast guard at some point. Louie radioed the Port Renfrew office because Bamfield was now closed, and they said they might be able to send a Coast Guard vehicle to the parking lot in Bamfield to find Helen and relay the message that I was safe and spending the night in a patrol cabin. After carefully considering my options I decided that it would be prudent to stay in the hut for the night, dry out, and resume my run in the morning. However, I was worried sick that the message did not get relayed to Helen – and I mean I actually felt sick to my stomach. The thought that she could be sitting in the car worried about me and watching the trail head for the faint light of my head lamp all night long, made me sick. But what could I do. I can’t say enough about my two buddies Louie and Jack in the patrol hut. They dried my clothes, gave me a bunk, blanket, made me hot noodles and coffee – really great guys. We chatted for a while watching Storage Wars on their small satellite TV and went to sleep at around 11:00 pm. And I didn’t sleep a wink all night! One of the guys snored, and to ‘mask’ the snoring, he tuned the TV to the Jack FM Vancouver radio station and adjusted the volume to snore level – Loud! I listened to Jack FM all night long. And I can definitely confirm that “At Jack FM, we play WHAT we want, WHEN we want”. I had the Vancouver weather forecast committed to memory “party sunny with a scattered shower or two”, and had a clear idea of the early morning traffic situation in downtown Vancouver. 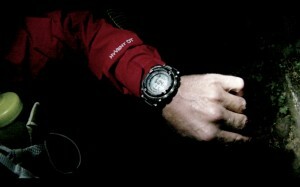 When my watch read 6:00 am, I quietly climbed down my bunk ladder, put my semi damp clothes back on, and hit the trail in the dark. As I ran along a beach section just before sunrise, I turned to look behind me for some reason, and saw a mother black bear and her 3 cubs on the beach behind me scavenging for something edible on the beach. I didn’t really care, but I whistled a bit to let them know I was there and they just continued to mind their own business, and so did I. The remaining 17 km took me only 3 hours. When I reached the Bamfield trail head parking lot, I was SO HAPPY to see our white Explorer rental car with Helen inside reading her book. She told me that the Coast Guard had found her at 9:00 pm last night, so she was able to sleep soundly knowing that I was safe. WHAT A RELIEF!! Running the West Coast Trail solo was hard – maybe even one of the hardest endurance events I have ever attempted. 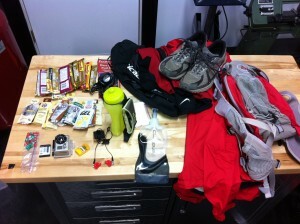 Not only is running the trail physically very taxing, but the adventure isn’t without a measure of danger. The WCT is remote – If I had fallen and hurt myself, it could possibly be up to a day before being found by another hiker. There are bears, cougars and even wolves that frequent the trail. Running the entire 75 km of the WCT requires a LIGHT pack, so hypothermia caused by a sudden unexpected weather change is always a possibility. I failed to achieve goal 1 – running in less than 12 hours because that was a ridiculously naive goal. The guys I know who have run the WCT that fast are MACHINES! I have no idea how they do it, but I do know for sure that I’m nowhere near that capable. I also failed to achieve goal 2 which was to finish in a day. I would have succeeded because when I reached the patrol hut, aside from starting to feel very cold due to the rain, and despite already running for 13 hours, I felt pretty good. My legs felt great, I had good energy and I was fully ready and capable of putting in another 3 to 5 hours. I just didn’t want to risk getting hypothermia. I think where I failed is perhaps not paying enough attention to the weather forecast. Running a trail in a single day means that you have to pack light, and rely on an accurate weather forecast for that day. When we left Calgary, the forecast was for sunny skies and I planned accordingly. But as my departure time neared, the forecast got steadily worse. 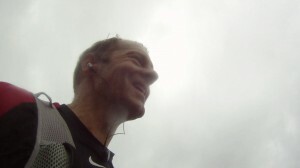 I made assumptions that I should not have made – and maybe attempting this run in the lower autumn temperatures with rain in the forecast isn’t a great idea. 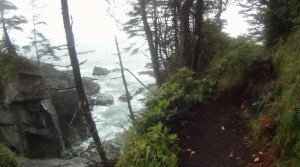 But, I did achieve goal 3 – I ran the West Coast Trail. It did take me a total of 16 hours, and an overnight stay, but I did it. And although I said it was very hard, I don’t think it is nearly as hard as what Helen had to go through. To be IN IT, and in control is difficult, but manageable. But to be on the outside, and have no control, and no information is painfully difficult. On Sunday night, Helen sat in the car at the trail head in Bamfield peering into the dark watching for the faintest glint of my headlamp. For hours. She even had my heated car seat fired up because she knew that I would be cold and wet when I arrived. I can’t imagine what she would have gone through if the coast guard didn’t contact her at 9:00 pm when they did. What she went through was far worse than what I was dealing with. I consider myself one lucky guy to have a wife as supportive as Helen! Fantastic! Awesome story, thanks for sharing! What an achievement, for you, and for Helen! It’s very inspiring that your story conveys the strong sense of personal drive and independence that you have while balancing it perfectly with your sense of family, teamwork and consideration for your other half! Wowza! Great adventure … and very sweet wife!